I had the idea to make this Top Ten Tuesday resemble magazine advertisements, it sounded really cool in my mind but my execution failed spectacularly lmao. I also had some surprise family visits so I could only do seven books! I AM SORRY. REAL LIFE CALLS. 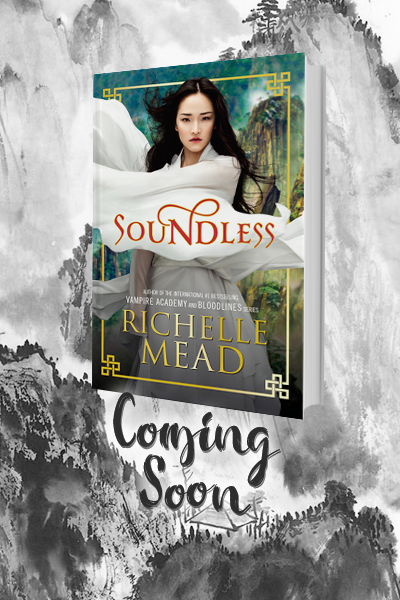 1) SOUNDLESS by Richelle Mead because it’s an Asian fantasy with a kickass cover, how could I NOT love it? 2) ILLUMINAE by Amie Kaufman and Jay Kristoff I feel like everyone and their dog has read this book, but I am still pretty excited because I saw someone compare it to Battlestar Galactica AKA MY FAVE SHOW EVER. 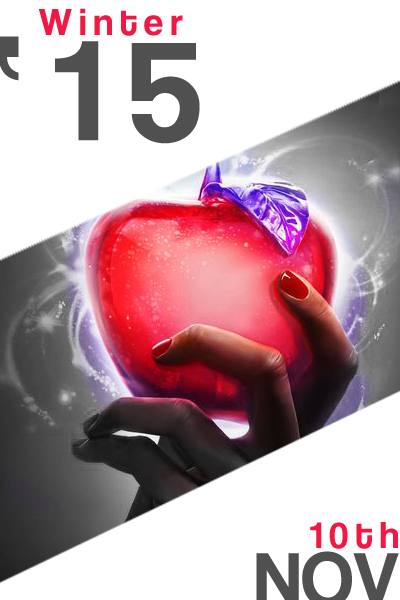 3) WINTER by Marissa Meyer because there’s a black Snow White! Also possibly the most anticipated sequel of this year, right up there with Queen of Shadows. 4) THE SLEEPER AND THE SPINDLE by Neil Gaiman because princesses that saves themselves and it’s Gaiman! Plus gorgeous pictures. WANT. WANT. WANT. 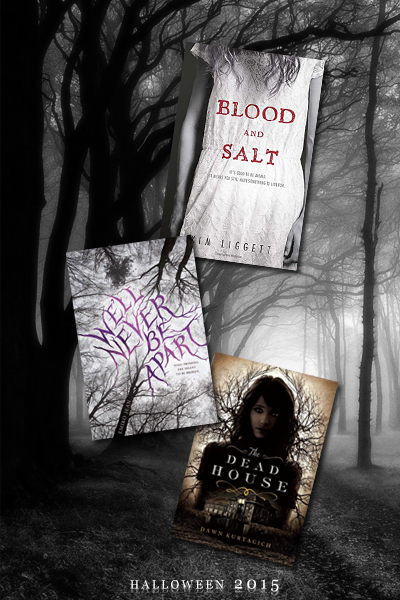 5, 6, 7) BLOOD & SALT, WE’LL NEVER BE APART and THE DEAD HOUSE all Halloween type titles I have heard great things about, and hope to read in October! Wow that is a lot of black and white and a lot of graphic fail. Remind me to never try to be hip again. ANYWAY! What’s on your fall TBR? I am pleased you like the graphics! I just thought it was quite different from my usual style so I was too unsure of it. EEP I am glad you like The Sleeper and The Spindle, makes me even more excited! I am so ready for Winter. SO READY! Also, The Sleeper and The Spindle is amazing. It’s a beautiful twist on Sleeping Beauty and Snow White. I think you would love the Lunar Chronicles series, so I hope you’ll get a chance to read it soon! I know right! I feel like all the US bloggers have already read it – there’s a launch night in Syd and Melbourne at the end of October though, will you be going? Your graphics are amazing, I think, as always! 😀 I think it’s time I add Illuminae to my TBR, it feels like everyone is talking about this story, I’m intrigued! 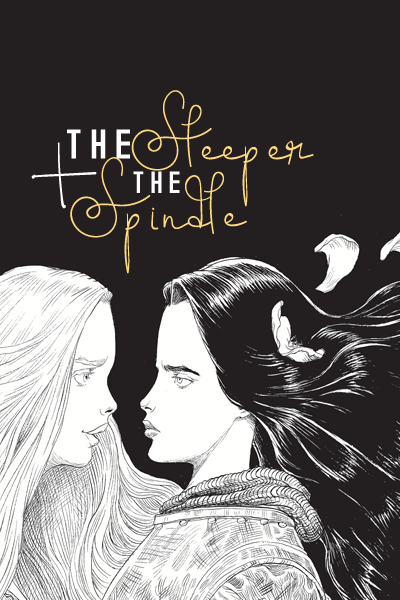 Interesting picks…I’m especially interested in The Sleeper and The Spindle by Neil Gaiman. 😀 Nice attempt with the graphics…I didn’t even bother thinking of how to present mine LOL…just wall of text! I love making graphics for the TTT because I’m worried they would be too short otherwise haha, I actually skip doing TTTs if I can’t think up of a graphic to do for it XD I AM SO OBSESSIVE. That is a great Halloween reading list! Thank you! Glad you think so!! I must recommend Rotting Frontier by Dave Atwell, I think I’ll insert it into my fall TBR to fit the Halloween theme. Teresa Frohock’s Los Nephilim is superb too. I think it all looks great. The Sleeper and the Spindle is great. So happy to hear that you enjoyed The Sleeper and the Spindle! I am really looking forward to reading it. Thank you! I am really excited for The Dead House as well, I am waiting for my next paycheck before I can purchase it! YES to Winter, Illuminae and Soundless. I can’t wait to read Soundless especially because it’s a fantasy and has an Asian protagonist! Yes I hope we both like Soundless as much as you liked Serpentine, there’s not enough Asian protagonists in my life! Oh my gosh, I LOVE your graphics! And Illuminae is fantastic! It’s one of my all time favorite books now, so make sure you do get to it for sure. I’m so excited for Soundless as well! Illuminae is my most anticipated book at the moment. I honestly can’t wait to get my hands on that book. Winter is also very high on my tbr list. Your graphics are wonderful. Great list. 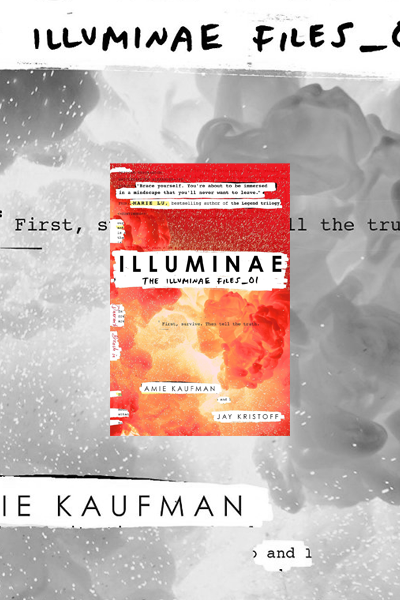 The marketing for Illuminae is insanely on point, it’s little wonder we are all so crazy for the book haha! where did you fail exactly? Those look amazingly stunning! I am not 100% sure on Soundless either because I thought VA was a bit of a mess, but it has a East Asian protagonist so I just want to support it on principles! Yasssssss! I’m so excited for Winter!! Hope we’ll both enjoy it, Mishi! No graphic fail here! I always love what you come up with! And I really enjoy your selection. So eagerly anticipating Winter – Marissa Meyer has created a seriously strong series. Eep I am glad you liked the graphics regardless 😀 Hope we’ll both enjoy Winter! Thank you so much Raven, glad you also enjoyed the graphics 😀 Hope we will enjoy all the books! Illuminae made it on my TBR list as well! I need to start it this weekend… we’ll see if I find the time! I just finished reading “Soundless” over the weekend, and really enjoyed it. Do you have an ARC copy of it? If not, I’d be happy to pass mine on to you once I get my review written. I don’t think it comes out until November. Yeah it doesn’t come out the November, but I am happy to wait, since shipping would be so expensive from the US! Thank you so much for offering though, I am so happy to hear that you enjoyed it! I also need to read the rest of The Lunar Chronicles before reading Winter, I think I’ll do a marathon week like I did with the Throne of Glass series last week! I am so glad to hear you gave the thumbs up to Illuminae and The Dead House, I trust your taste and therefore I am doubly excited now! I’m looking forward to all of these books, too! If I read Soundless, it will be my first Richelle Mead read. It’s the first of her books that interest me so far, although I’ve heard her others are promising. Just for the record, though- my dog and I have not yet read Illuminae (I don’t have a copy yet. I don’t even have a dog…lol). I am really excited for Winter but I need to catch up on the rest of the Lunar Chronicles series. I *cringes* haven’t read past Cinder yet but I liked the first book! To be honest I did not really enjoy VA which were the only Richelle Mead books I’ve checked out -but I heard her second series Bloodlines is excellent. Plus, Chinese inspired fantasy, I really can’t say no to that haha. I also need to read the rest of the TLC series as well, like you, I have not read past Cinder but I am sure it should be fantastic. Can’t wait to hear your thoughts on all of those titles, especially for Illuminae 😀 there’s been so much hype and love for that series I almost feel like it’s too good to be true, haha. I just started We’ll Never Be Apart, though I’m not very far in yet. The Sleeper and the Spindle looks great. Good choices! Are you enjoying We’ll Never Be Apart? I am glad you liked The Sleeper and the Spindle! That one sounds awesome from what I have heard so far. Yes, I keep forgetting about it because I have not seen too much hype about it, but Soundless sound amazing! Illuminae is pretty much old news by this stage, but I still want to read it so badly! So excited for The Sleeper and the Spindle! Anything by Neil Gaiman is an instant buy for me! I can’t believe I didn’t think of that one on my list! I used to read every single Neil Gaiman book as soon as they were released, so I’ve been dropping the ball this year XD I really need to fix that starting with The Sleeper and the Spindle. Yeah I tried reading Jay Kristoff’s Stormdancer and had to side eye the Japanese appropriation a lot — but hopefully with Amie Kaufman there to temper him this one will be OK? Winter!! Cannt wait. I really want to read We’ll Never be Apart too – Great list!! Ooo another fan of The Sleeper and the Spindle! I have only heard good things about it so I am really excited! I really want to read Soundless! I love Richelle Mead and I adore the concept of an Asian MC! ILLUMINAE!!! I CAN’T WAIT TO READ THAT BOOK! ILLUMINAE, WINTER AND BLOOD AND SALT ARE ON MY TO BE READ AS WELL! I CANT WAIT FOR BOTH OF US TO READ IT AND BE ABLE TO DISCUSS IT <333 YOURE ALSO GOING TO MEET JAY AND AMY IN THE SIGNING AND IM SO JEL. I WONT BE ABLE TO MEET THEM BUT MY MOM'S FRIEND IS GOING FOR ME TO GET ME A SIGNED BOOK SO YAY. I love you graphics as always. Thanks for sharing your picks, Aentee. I have Soundless and Illuminae on my list too. Ah, FABULOUS choices, at least of the ones I have read and want to read, which is… all of them except one which I never heard of (the Neil Gaiman one). Illuminae IS fabulous. My dog said so too 😉 (I don’t even have a dog.) I also loved Blood and Salt, so another great choice! Hope you love all of these, it’s a fantastic looking bunch! I love your graphics SO MUCH, they’re so pretty! I really want to read Illuminae and Soundless – THEY LOOK AMAZING. Also, I really want to read some creepy books in October so I’ll definitely check those last few out too! Thank you for this blog post! I am so used to seeing the same books all over the place, but I like your first pick, ‘Soundless’. I hadn’t heard of it before and now I’m intrigued. 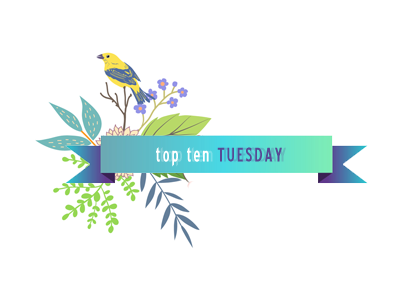 ^.^ Top Ten Tuesday is such a great way to hear about new books!